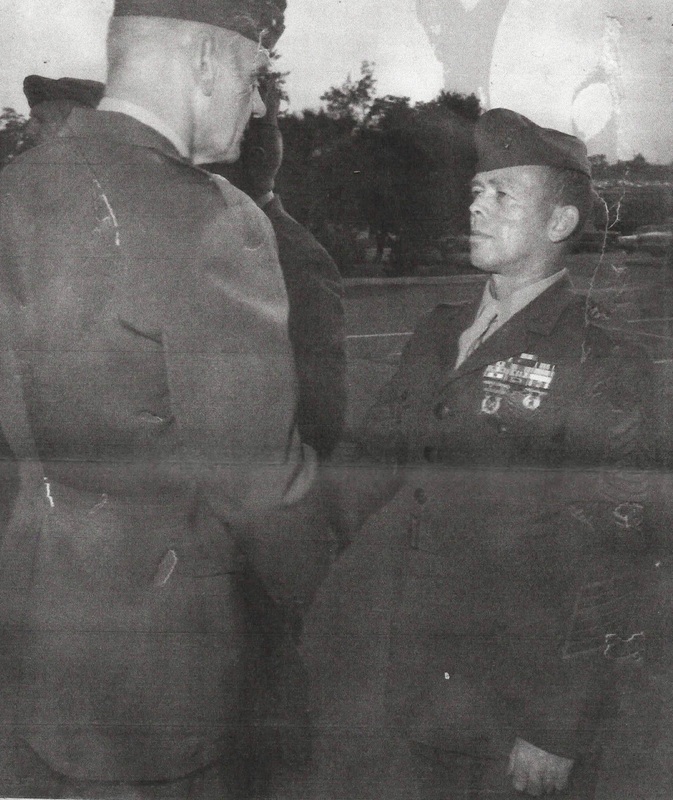 Master Sergeant Franklin H. Upton (right), on his retirement. Cover of Leatherneck Magazine (1975). Recruit training at Parris Island, served with Marine Ground Control Interception Squadron 7, Cherry Point Marine Fighter Squad 219, Guam Marine Recon Squadron 153 at Tsingtao, China & Cherry Point. 3 Battalion, 1st Marines - 1st Marine Division in Korea, 5th Signal Company USMCR. 1st Battalion 7th Marines, 1st Marine Division at Camp Pendleton, 1st Marine Brigade Hawaii, 3rd Battalion 7th Marines, 2nd Battalion 5th Marines 1st Marine Division, 3rd Battalion 3rd Marines 3rd Marine Division, Okinawa, 3rd Infantry Training Regiment, 4th Marine Division, 3rd Battalion 1st Marines & Headquarters 1st Marine Division Vietnam, Headquarters 3rd Marines & Brigade Schools Center, 5th Marines Amphibious Brigade. Combat Action Ribbon; Navy Unit Commendation; Good Conduct medal (8); WWI Victory Medal; China Service Medal; National Defense Service Medals (2); Korean Service Medals with 2 Battle Stars; Armed Forces Expeditionary Medal; Vietnam Service Medal with 1 Battle Star; United Nations Service Medal; Republic of Korea Presidential Unit Citation; Republic of Vietnam unit award Gallantry Cross with Palm & Republic of Vietnam Campaign Medal. Master Sergeant Frank Upton (deceased) retired with honors in 1975. He was also a 15-year Teamster driver for Loomis Armored Car Watts, L.A. Dad was very passionate about his Marines! We lived on Conquista Ave in the 70's & 80's. We've had many friends who live in Lakewood.